Shopping for Star Trek Bobble Heads? Add the U.S.S. Enterprise NCC-1701-D to your computer monitor! Captain Jean-Luc Picard's starship from Star Trek: The Next Generation. Miniature bobble head features a non-damaging adhesive pad. It comes packaged on a TNG-themed blister card. Shields up! Red alert! Travel to the 24th century with the Galaxy-class, fifth Federation starship to carry the name Enterprise, commanded by Captain Jean-Luc Picard! You can have the U.S.S. Enterprise NCC-1701-D from Star Trek: The Next Generation sitting right there on your computer monitor with the out-of-this-world Star Trek: The Next Generation Enterprise Monitor Mate™ Bobble Ship with clear base. Crafted of PVC plastic, the TNG starship mini bobble head measures about 2 5/8-inches long x 1 7/8-inches tall (including the base) x 2-inches wide and features a non-damaging adhesive pad that sticks it to your monitor or any smooth, even surface. It comes packaged on a TNG-themed blister card. Arm those phasers and photon torpedoes and order yours now! One of the largest cult phenomena of our time, Star Trek is a science-fiction entertainment franchise based on a fictional universe created by Gene Roddenberry. It includes a multitude of television series, movies, video and computer games, novels, and more depicting an optimistic future in which mankind has risen above past frailties and vices to unite with other intelligent species in the galaxy to explore the cosmos, discover new worlds, and encounter new civilizations - "To boldly go where no one has gone before!" Ages 14 and up. NOTE: This item will first be sold at San Diego Comic-Con 2017 at the Entertainment Earth Booth #2343. If supplies remain after the show, your order will be filled and shipped to you then, in August 2017. 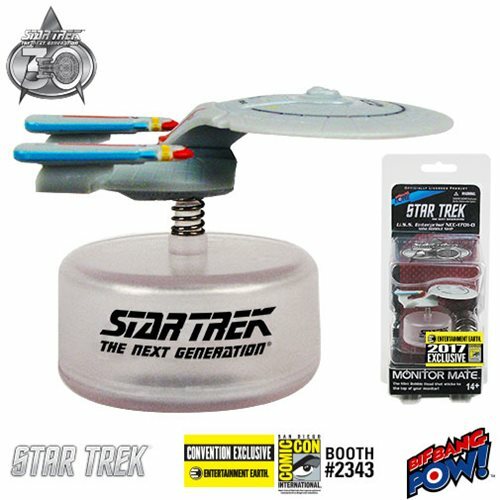 Entertainment Earth SDCC Exclusive Star Trek: TNG Enterprise! Shields up! Red alert!